This article is about Monterey Jack cheese. For other uses, see Monterey Jack (disambiguation). Monterey Jack, sometimes shortened to Jack, is an American white, semi-hard cheese made using cow's milk. It is noted for its mild flavor and slight sweetness. In addition to being eaten by itself, it is frequently marbled with Colby to produce Colby-Jack or with yellow cheddar to produce cheddar-Jack. Pepper Jack is a version flavored with chili peppers and herbs. In its earliest form, Monterey Jack was made by 18th-century Franciscan friars of Monterey, Alta California. California businessman David Jack sold the cheese commercially. He produced a mild white cheese that came to be known eponymously as "Jack's Cheese" and eventually "Monterey Jack". Other ranchers in the area likewise produced the cheese, among them Andrew Molera, who built a successful dairy operation in Big Sur and whose Monterey Jack was especially well regarded. Although most of the softer varieties found in American supermarkets are aged for only one month, "Dry Jack" is a harder variety aged for up to six months. Dry Jack was created by accident in 1915, when a San Francisco wholesaler forgot about a number of wheels of fresh Jack he had stored. As World War I intensified and shipments of hard cheese from Europe were interrupted, he rediscovered the wheels, which had aged into a product his customers found to be a good substitute for classic hard cheeses like Parmesan. Pepper Jack is a derivative of Monterey Jack flavored with spicy chili peppers, bell peppers, and herbs. Because of its low content of tyramine, an organic compound thought to be associated with headaches, Monterey Jack is frequently recommended as one of the few cheeses that is safe to eat for migraine sufferers. ^ Brown, Robert Carlton. "The Complete Book of Cheese, Chapter 4: "American Cheddars". Gramercy Publishing Company: New York. Monterey Jack is a stirred curd Cheddar without any annatto coloring. It is sweeter than most and milder when young. ^ Wisconsin Cheese: Colby-Monterey Jack. Wisconsin Milk Marketing Board. ^ Feldman, David (2006). Why do Pirates Love Parrots? An Imponderables Books. New York: Collins. pp. 53–55. ISBN 0-06-088842-3. ^ Fabricant, Florence (May 10, 2000). "The Riches of Spain: Its Cheese; A New Appetite In America". 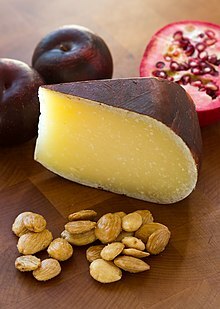 Mahon, a cow's milk cheese from the island of Menorca, with an orange rind, has the kind of nuttiness with buttery overtones you might associate with aged Monterey Jack and is good used just the same way. ^ a b Sarah Koops Vanderveen, Special to The Chronicle (1995-09-27). "Dry Monterey Jack Cheese: What's Old Is New Again - SFGate". Articles.sfgate.com. Retrieved 2015-02-26. ^ "Dry Jack". Cheese.com. Retrieved 2015-02-26. ^ "Pepper Jack". cheese.com. Retrieved 24 December 2016. ^ "Headaches from Food: The Connection". Medicinenet.com. 2005-03-29. Retrieved 2015-02-26. Wikimedia Commons has media related to Monterey Jack. Dairy Research & Information Center (ed.). "The Legend of Monterey Jack Cheese". UC Davis. Dairy Research & Information Center (ed.). "The True Story of Monterey Jack Cheese". UC Davis.